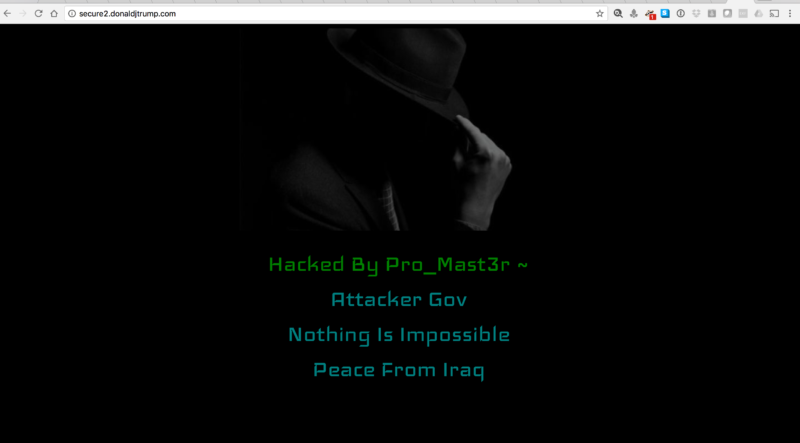 A group of hackers who calls themselves "pro_Mast3r" on Sunday defaced a website associated with Donald Trump's presidential campaign fundraising. The website was hosted on the server secure2.donaldjtrump.com that is managed by the cloudflare content management and security platform. According to Arstechnica, that website is not directly linked from the Trump Pence campaign's home page but does appear to be an actual trump campaign server that uses a legitimate certificate, "but a reference to an image on another site is insecure, prompting a warning on chrome and Firefox that the connection is not secure," arstechica said. What's strange in the hack is that the java script the attackers used was no more available in the wild.